When was “the heyday of the great seaside amusement park piers” anyway? 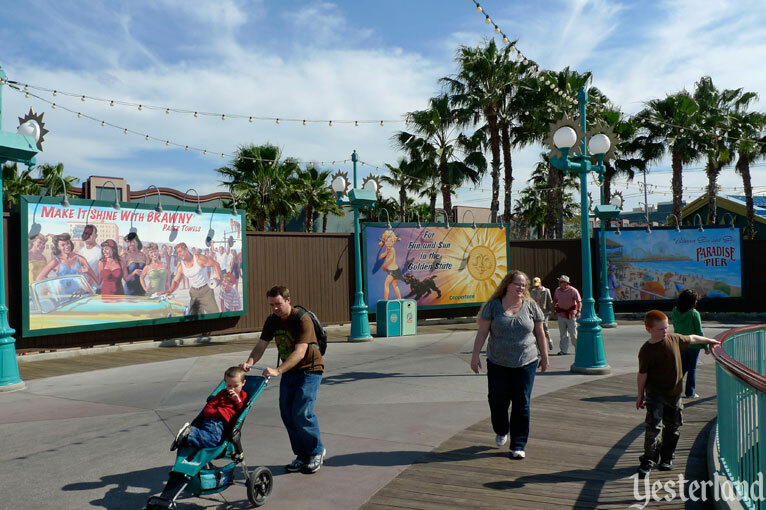 Perhaps we can figure that out from the “vibrant graphics” on the four custom billboards in this corner of Yester Paradise Pier. 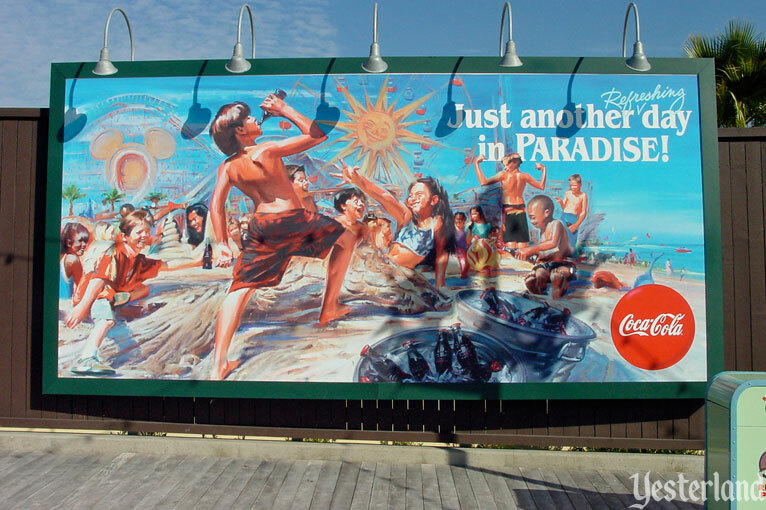 The first billboard features Coca Cola. A kid is drinking Coke from a glass bottle. In the background, the Mickey head shape on California Screamin’ and the stylized California Sun of the Sun Wheel fill much of the bright blue sky. But what decade is it? Perhaps the 1950s? Coca Cola ads prior to the 1960s used painted illustrations; then Coca Cola switched to photographs. The returnable glass bottles also suggest that it’s many decades ago, long before plastic bottles and aluminum cans took over. But the font on the billboard is from the 1970s. And the kids are dressed in beach apparel from the 1990s—just look at the sneakers, swimwear styles, and the fabrics. In other words, it’s impossible to pin this billboard to a particular decade. 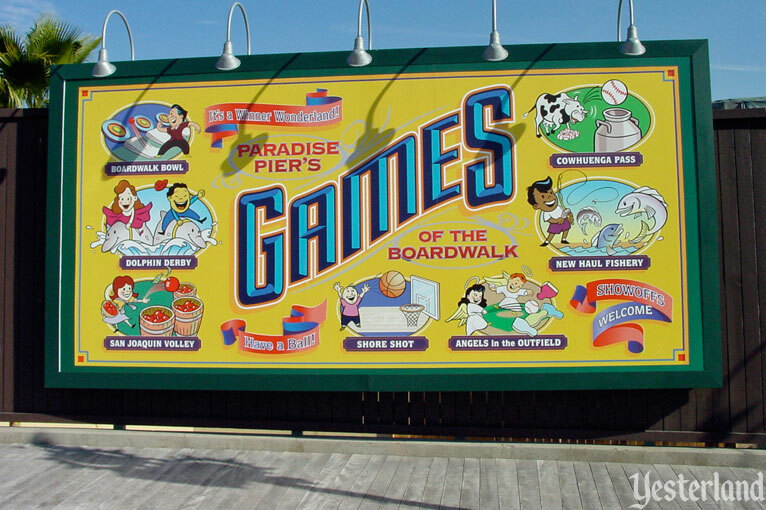 The second billboard promotes the Games of the Boardwalk, just a short walk away past Boardwalk Betsy’s World Famous Strips, Dips ’n’ Chips and Malibu-Ritos. The cartoon people on the billboard are reminiscent of drawings from the 1930s and 1940s, such as the mascot from the game Monopoly (1935). The style of the large “Games” in the center seems to harken back to the 1920s and 1930s. The scrolls represent an even earlier period. The color palette and the use of gradients in the ovals suggests the 1990s. Again, it’s a billboard that’s all over the 20th century. But at least the drawings are kind of fun. The third billboard isn’t really a billboard. It’s a set of two photo opportunities. The left one lets someone pose behind a cutout representation of a Golden Zephyr rocket. Once again the iconic Mickey head shape and Sun Wheel are in the background. The right one simulates the top of the California Screamin’ loop. When you get your prints back from the drugstore, put that picture in your photo album upside down so that the Orange Stinger and Mickey head loop are right-side up. Clever, eh? There’s just one problem. The square backgrounds would be perfect if film frames were square. But it’s 2001. Most people these days capture rectangular images—whether with a common 35mm film camera or with one of those new-fangled digital cameras that people are now buying. Perhaps you can dust off your old Kodak Instamatic camera from the 1960s; it produces square images using “126” film cartridges. Once again, it’s hard to tie the billboard to a particular decade. More than any other period, the artwork has the look of the 1990s. 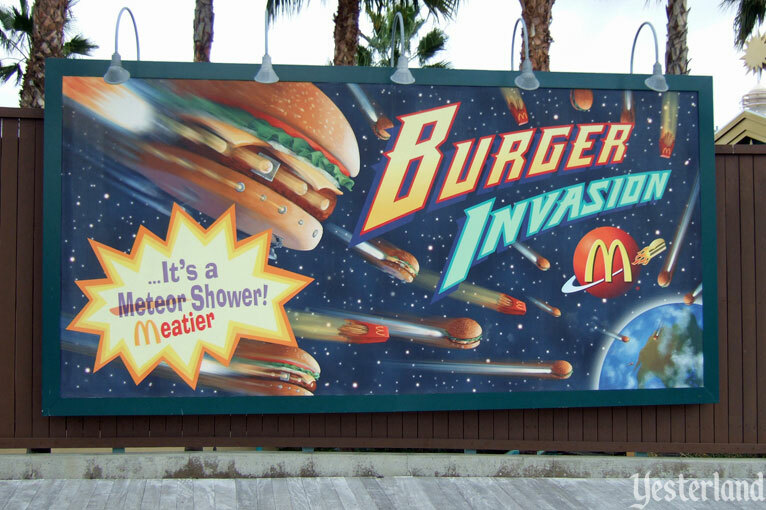 The final billboard advertises Burger Invasion, the McDonald’s-sponsored quick-service eatery that looks like a cross between a hamburger and an alien spaceship. Don’t miss the pun on the sign. 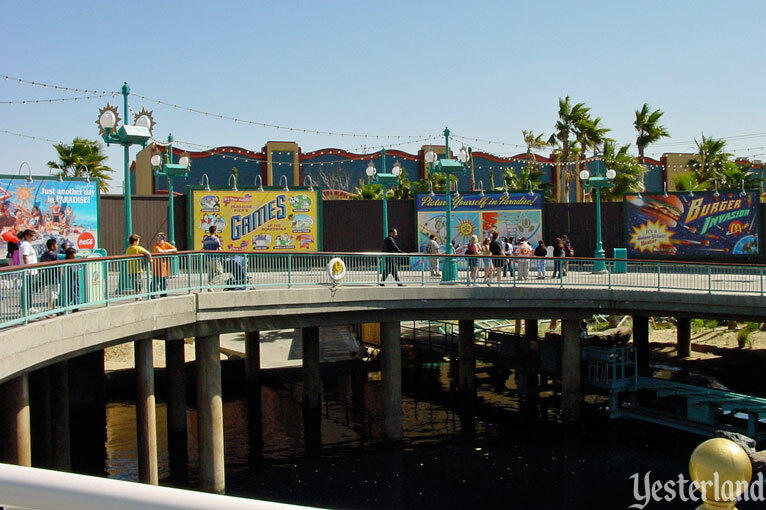 The California Adventure park of 2001 is known for many puns. Because the billboard uses comic book art, we could associate this billboard with the 1940s, which many consider to be the middle of the Golden Age of Comic Books. Or maybe it’s meant to look like a movie poster illustration. Then again, the art is also somewhat reminiscent of the Star Tours and Buzz Lightyear Astro Blasters murals in Disneyland. 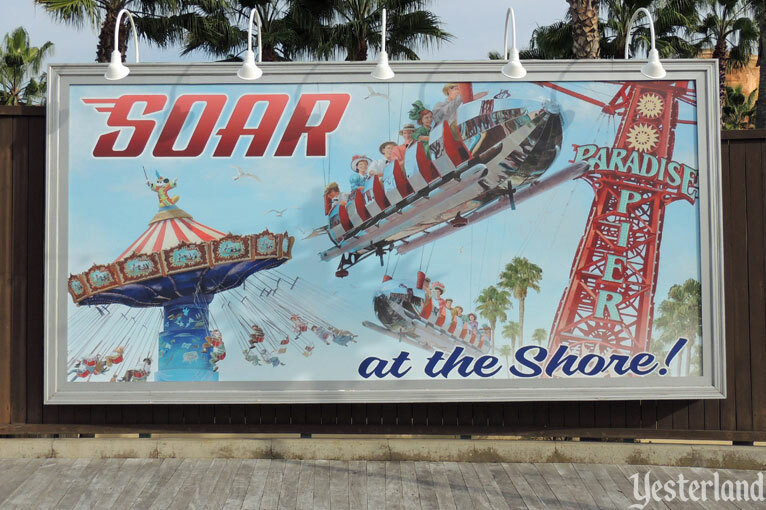 We have failed to identify the heyday of California amusement piers from these billboards. 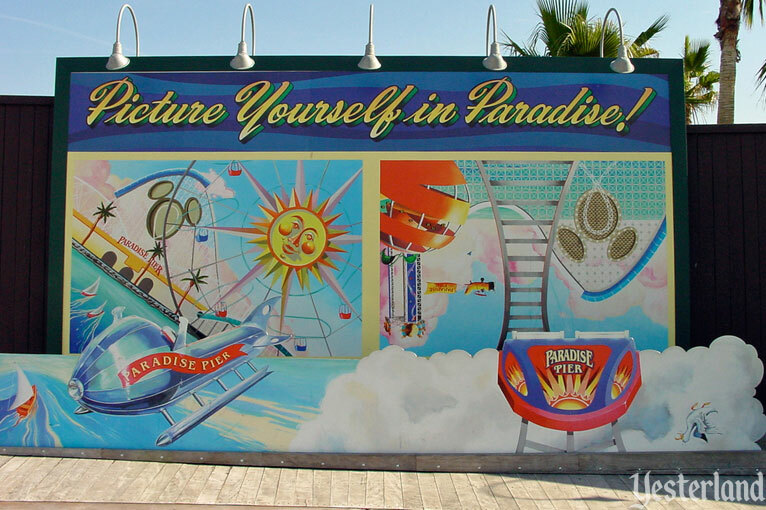 But, in a way, the billboards of 2001 are a perfect metaphor for Paradise Pier in 2001. 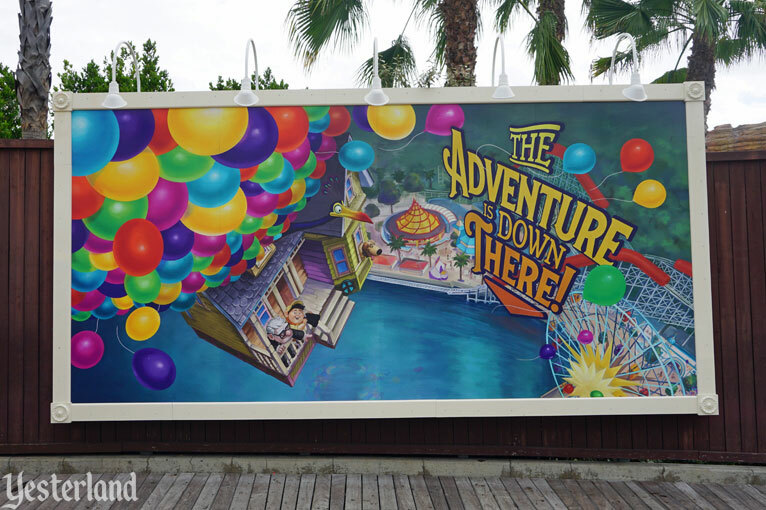 Just as the billboards lack a cohesive story and sense of time and place, so does Paradise Pier. 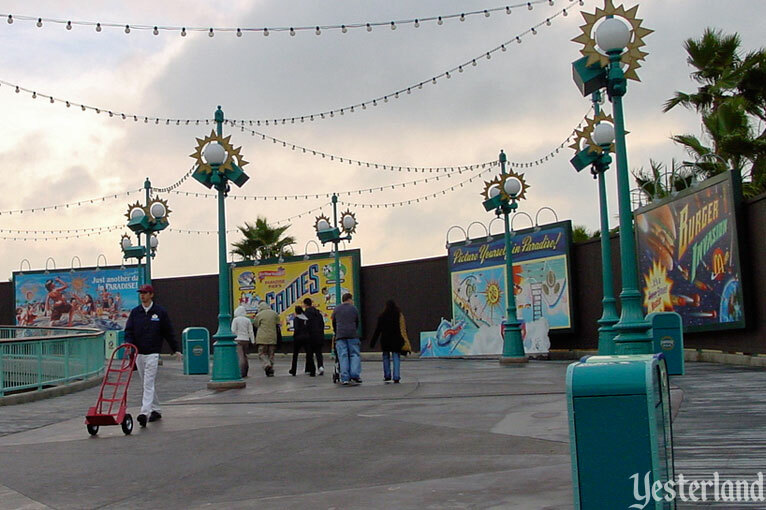 When Disney’s California Adventure opened in February 2001, the park had four custom billboards in a row. The row is still there, but the billboards have all changed over the years—each at least twice. The first original billboard to go away was the photo opportunity spot. 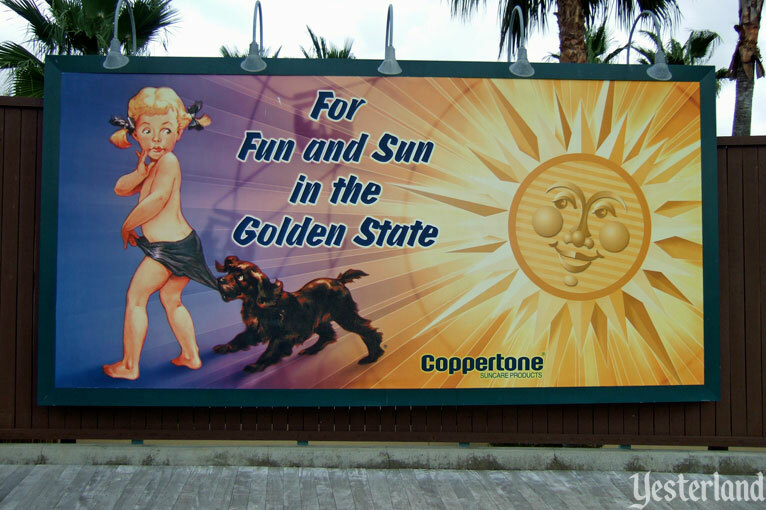 In August 2002, a custom billboard for Coppertone Suncare Products replaced it. Tan, Don’t Burn. Get a Sun Wheel Tan. The new billboard was based on the classic Coppertone advertising image of a little girl’s embarrassment when her dog exposes her untanned skin by pulling down part of her swimsuit. Only in the Disney version, the dog revealed nothing—not even a distinct tan line. The Disney version of the suit was apparently made from very stretchy material. 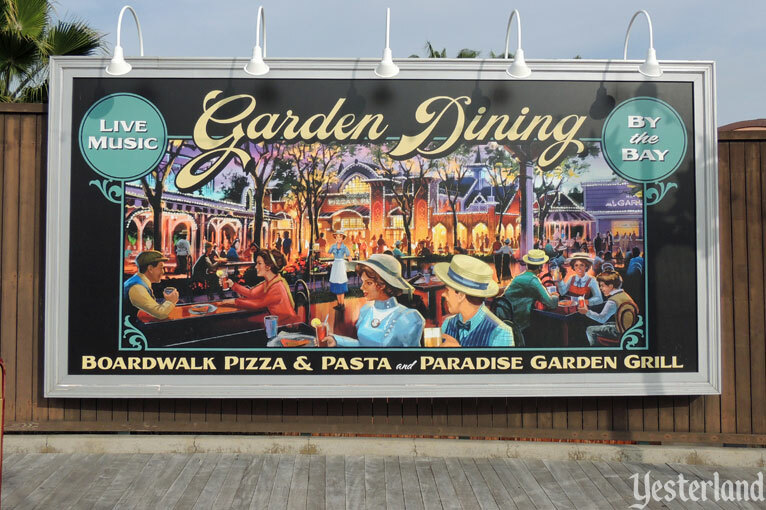 The next billboard to disappear was Games of the Boardwalk. In January 2005, Disney and Georgia-Pacific announced a 10-year strategic alliance. Among various promotional tie-ins, Brawny paper towels would sponsor the new Lights, Motors, Action! Extreme Stunt Show at the Studios park in Florida. Quilted Northern toilet paper signs then showed up on walls in U.S. Disney parks. 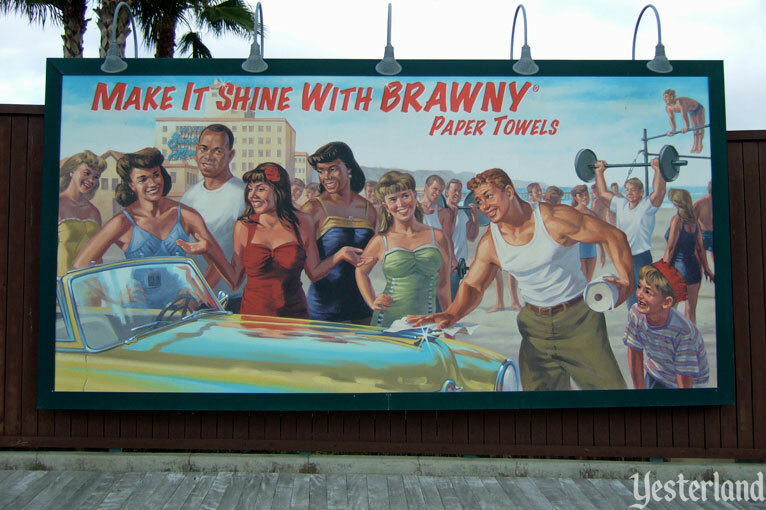 The new billboard showed a brawny man using Brawny paper towels to polish a gleaming convertible from around 1949—garnering admiration from beautiful women and a guy in a white tee-shirt. 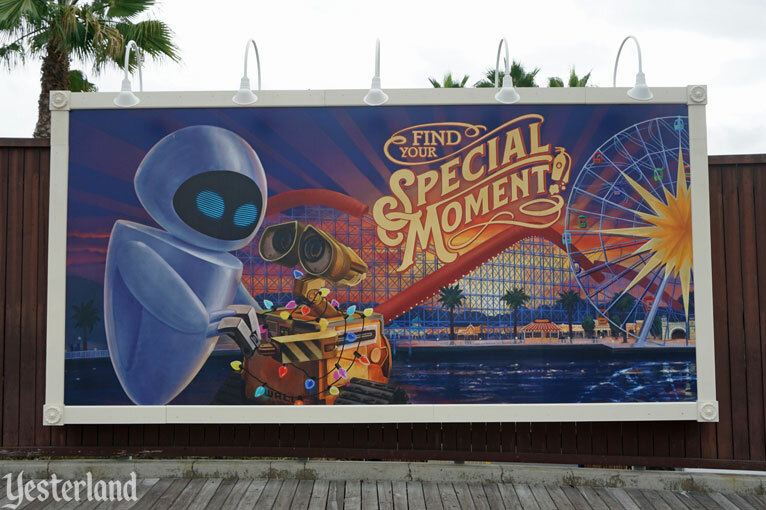 The same billboard also appeared atop Mickey’s of Hollywood at the Studios park. Never mind that the car was too new for the period of either Paradise Pier or Hollywood Blvd. At least this billboard projected a sense of place and time, even if it was the wrong time. After a different strategic alliance ended—the one between Disney and McDonald’s—another billboard changed. 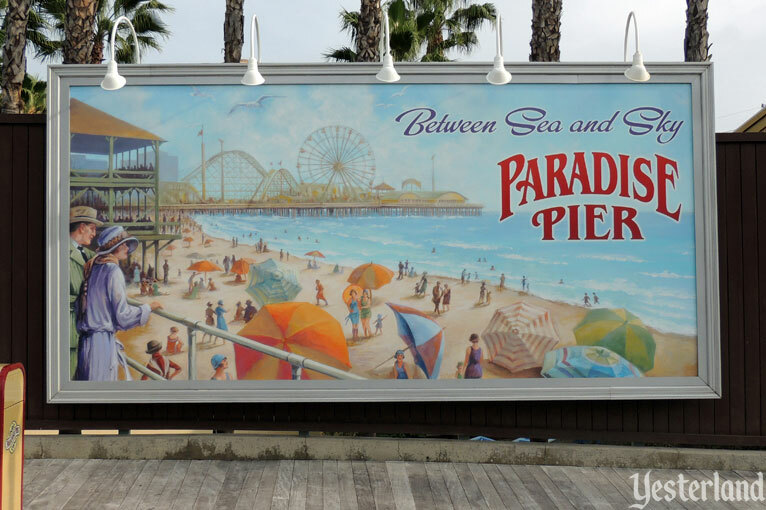 The former Burger Invasion billboard became a beach scene with Paradise Pier in the background—without the Sun Wheel or the Mickey head on the roller coaster. It was December 2008, and it was the first billboard to roll back time to the early 20th century. What had been a mishmash of 20th century styles with no clear time period began a transformation. It began with the opening of Toy Story Midway a half year earlier and continued with other enhancements to Paradise Pier over the following years. 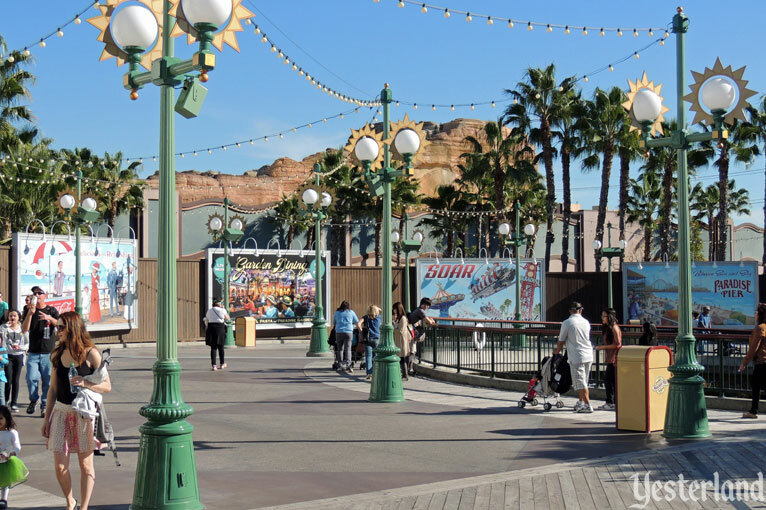 When Cars Land opened nearby in 2012, its rockwork became a new backdrop for the billboards. Instead of being a visual intrusion, the rugged rock structures suggested the cliffs along many Southern California beaches. It worked surprisingly well. In May 2012, the newest billboard on billboard row became the oldest. 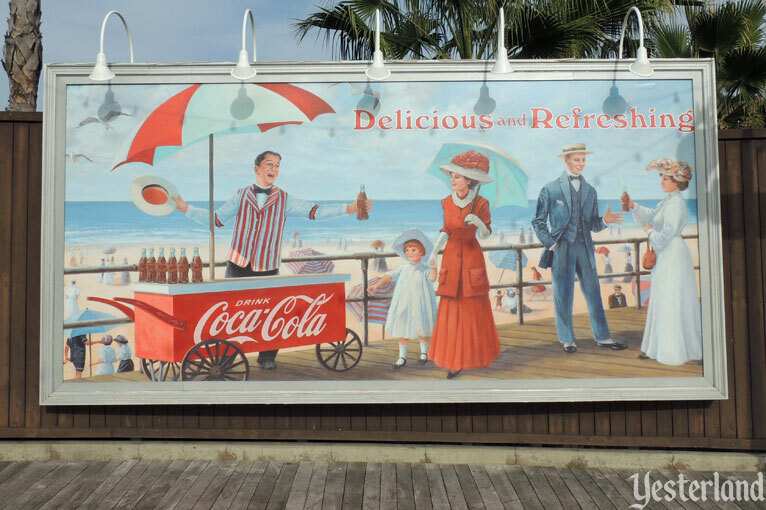 The original Coca Cola billboard, the Brawny billboard, and the Coppertone billboard were all replaced. Finally, all four billboards had a consistent style and place in time. 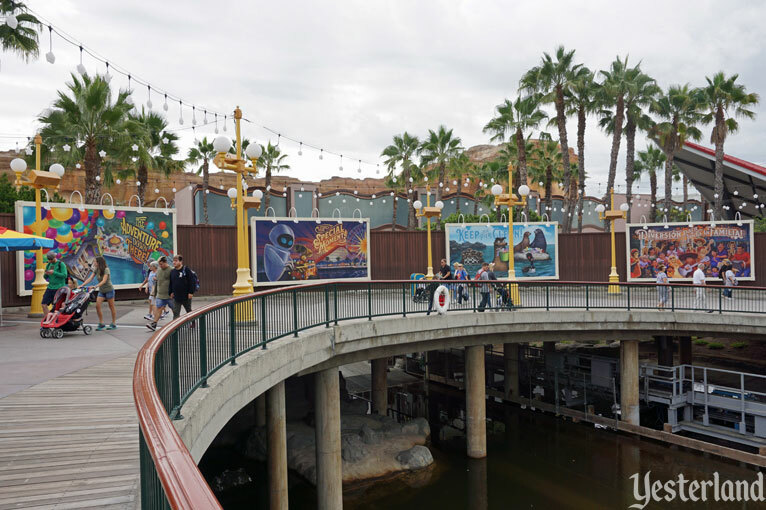 In June 2018, Disney split Paradise Pier into two new lands: Pixar Pier and Paradise Gardens Park. 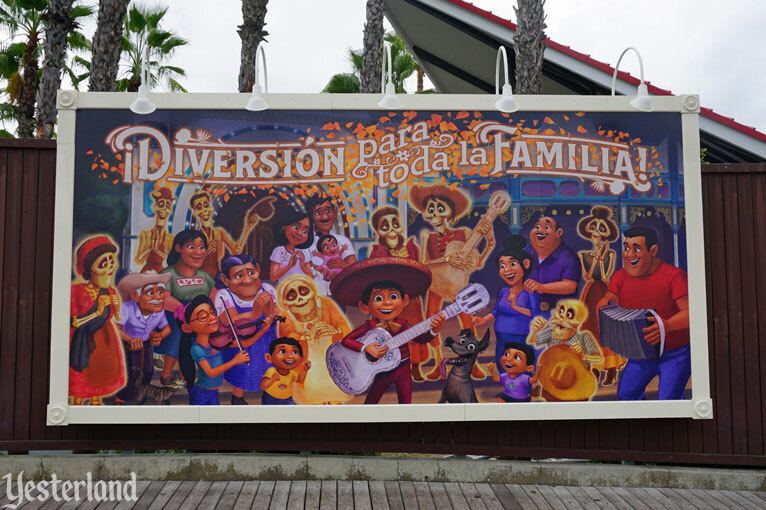 The billboards, located in Pixar Pier, needed to change. And they did. 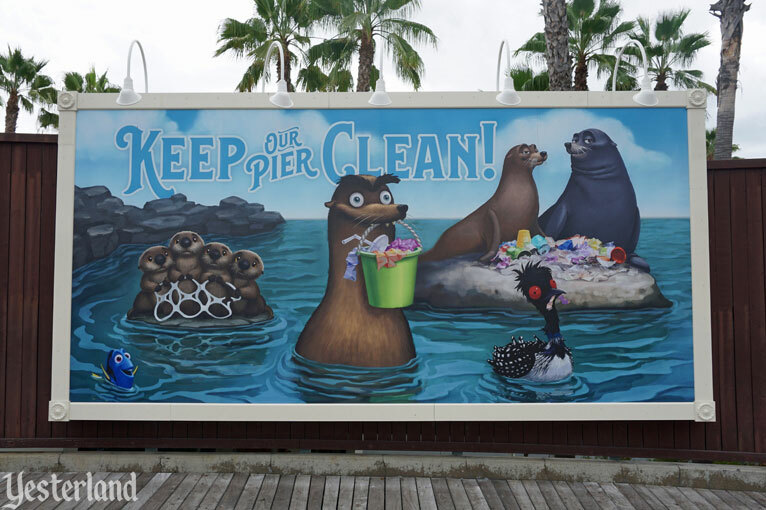 So experience the adventure of Pixar Pier; find your special moment there; enjoy all its family fun—and please recycle your recyclables and properly dispose of your trash so it doesn’t wind up in the ocean.